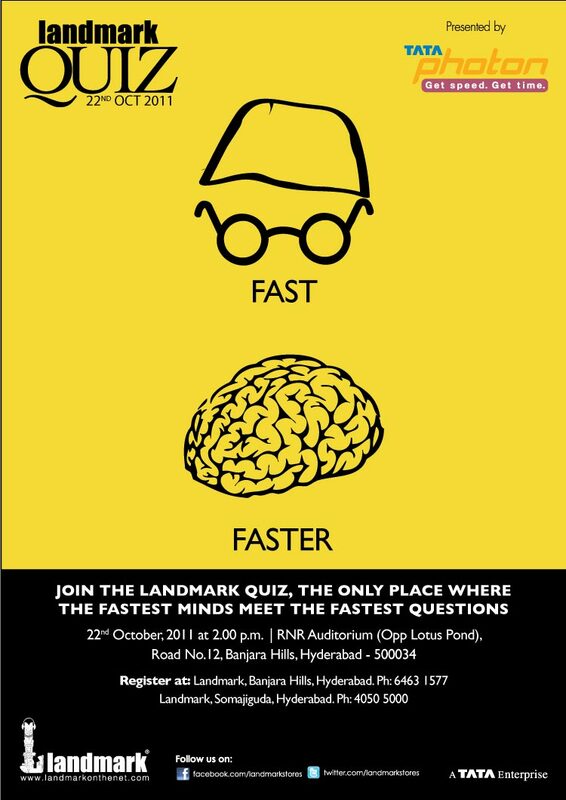 The first ever edition of the Hyderabad leg of Landmark Quiz 2011 would be held on 22nd October at RNR Auditorium. Please click on the image for details. 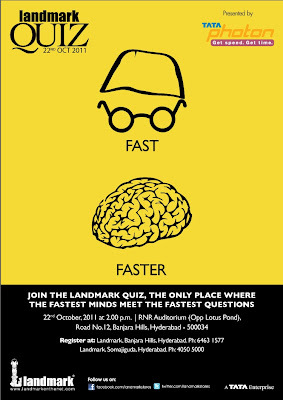 One of the biggest quizzes in India, this would be a treat for each and every quizzing enthusiast in the city. Please do register in advance to ensure that you get to participate in this event. 1. It gets its name from the fact that it was observed mostly around Christmas by South American fishermen. A study conducted in 1998 also alludes to this having caused poor crop yields in Europe in 1789-93 which in turn might have helped spark of the French Revolution. 2. Students at the Univ Of Konstanz recently demoed a unique project aimed at providing a revolutionary new navigation system for the blind that analyzed the space around them and then helped them to navigate the space by giving voice instructions. This system consisted of a belt to be worn by the user which housed the feedback system and helmet with a device mounted on it that formed the heart of this system. Which “unusual” device did this system use? 3. In the 1600’s when Christopher Wren was redesigning the St. Paul’s Cathedral he was faced with a peculiar problem. He wanted to construct a huge dome but did not know the structure would support the weight. He posed this problem to his friend X who incidentally had been studying the work of Christian Huygens related to chains. X suggested that Wren should design the dome in the form of an inverted chain since that dome can support its own weight and does not need external support. He even came with the equation to describe such a catenary dome and Wren went back and constructed such a dome and the rest is history.Who was the unlikely architect of the dome of St. Paul’s Cathedral? 4. Composed of large, white, sweeping dunes, Lencois Maranhenses, a national park and not a desert, lies just outside the Amazon basin. The region is subject to a regular rain season during the beginning of the year which cause a peculiar phenomenon: fresh water collects in the valleys between sand dunes, spotting the desert with blue and green lagoons. Why or how do we know this place? 5. Super 30 is a highly ambitious and innovative educational program which hunts for 30 meritorious talents from among the economically backward sections of the society and shapes them for India's most prestigious institution – the Indian Institute of Technology (IIT). After which famous Indian is it named? Yes, with India all set to get a drubbing at Lords, Baba Ramdev no more running in drag on National Television and Anil Kapoor having been snubbed in the MI-4 trailer, the world is no more a nice place. We, however, are such nice people that we are going to do what no one else has done, ever before. We are going to give away our rejects. Yes! The Greenko Open 2011 rejects and not old, expired questions. Fresh from the editing board and with much heartburn from the owners of the respective questions. As the start of our benevolence, this Saturday Late Night Fever edition of five questions is just the beginning. The first one in Jun 2010 lasted 665 minutes. The second in Jun 2011, a mere 123 minutes. What are we talking about? The purchase of which famous painting in 1937 for $110,000 with funds from a trust fund for the Philadelphia Museum of Art by their major benefactor Joseph E. Widener was welcome by the editorial of "The Philadelphia Record" as "No less than 41,000 of the city's dwellings—one in every ten—are without bathtubs and One hundred and ten thousand dollars would buy bathtubs for nearly half of these bathtubless dwellings.''? They are a gotra (clan) of Jat, found in the eastern uplands of Sargodha and Gujrat districts, of Punjab, Pakistan. A small number are also found in Jhelum and Gujranwala districts. The most famous of them went by the name Dheedo but was immortalized as the gotra / clan name as part of an epic love story. Who? To whom is this Google doodle a tribute? Fellow accumulators of useless knowledge and esoteric trivia, pay close attention. This is the time to mark your calendars. Rustam-e-Dauran, Arastu-e-Zaman, Muzzafar-ul-Mulk, Wal Mamalik, Field Marshal, Fateh Jung, Sipah Salar, Faithful Ally of the Quizzing Circuit, Nizam-ud-Daula, Nizam-ul-Quizdom, Greenko Open Quiz IV is bringing its tashreef. It will be held on 30th July (Saturday) 2011 between 2:00 pm and 8:00 pm in Hyderabad at the RNR Auditorium, Banjara Hills. Please do mark it in your calendar and be there. Time: Prelims at 2:00 p.m. and finals at 5:00 p.m. Entry Fee: 0. Nil. Zilch. We're back, baby! We're back!! And we've changed venues. This time it will be in a vastly superior hall that we will bheja fry some of the best quizzers in India. Eligibility: Must have pulse. Central nervous system desirable but not mandatory. Entry Fee: Nil. Zero. Zip. Nada. There is no need for any registration either. Cash prizes for all finalists! Special prizes for school teams and corporate teams also. Attractive audience prizes as well. The 6th edition of the Phase Forward ACE Corporate General Quiz will be conducted in a couple of weeks. Mega-Whats is a quiz designed to answer the question ‘Which is India’s best open quizzing team?’. The operative word here is ‘open’; anybody can form a team to participate, and any team can win. The syllabus, to preempt the obvious question, is surprise. The quiz will be held across nine cities simultaneously--Bangalore, Chennai, Hyderabad, Goa, Thrissur, Mumbai, Pune, New Delhi and Kolkata. Venue: Vasavi Hall AC Auditorium(3rd floor), Opp Sensation Theatre, Khairtabad, Hyderabad. To register, please email kqaquizzes@gmail.com with Mega-Whats 2009 and the city you are competing from in the subject-header. Email registrations will close on Sunday 6th December 2009. Centre coordinators will allow entries after the cut-off date at their discretion. Please note that the quizzing community in your city may charge an entry fee to meet venue and equipment hire expenses. For Hyderabad this entry fee will be Rs.150 per team. The school category is open only to teams comprising students from Std. VIII-X . Please report by 1430hrs at the venue in your city. The quiz will start at 1500hrs (sharp) and end by 1730hrs. Contesting teams will answer a written quiz of six sections and about sixty questions, inclusive of audios, videos and visuals. Answers and scores will be announced on the same day–prizes will be given out for Best School Team and Best Open Team. Prizes for Open and School category winners. We will also announce a national winner and rank the top 100 teams across the country–this list will go up by the 25th of December. The rankings will be announced after adjudication. The decision of the quiz-master will be final and binding on all participants.